1L. H. Bonani (e-mail: luiz.bonani@ufabc.edu.br) and J. C. F. Queiroz are with the Center for Engineering, Modeling and Applied Social Sciences, Universidade Federal do ABC, Santo André, Brazil. 2M. L. F. Abbade is with Universidade Estadual Paulista (UNESP), São João da Boa Vista, Brazil. 3F. Callegati is with University of Bologna, Cesena, Italy. In this paper we show that the adoption of a simple weighted ordering heuristic strategy to find fixed shortest path routes in a topology can improve load-balancing and, consequently, network performance. 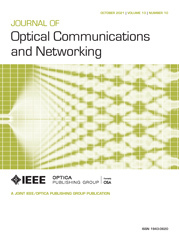 We compared our fixed routing strategies against the k-shortest paths (k-SP) fixed-alternate routing strategy for three different mesh topologies considering fixed grid networks (FGNs) and elastic optical networks (EONs). The results show that our simple fixed routing strategies can improve network performance for an optical network system, even compared with the fixed alternate routing and always using the shortest path. Results also show that such easy strategies act mainly in longer routes, increasing their probability of use and balancing the link load distribution. a Average of 30 replications rounded to the nearest integer. a Average of 30 replications, rounded to nearest integer. a Average of 30 replications.